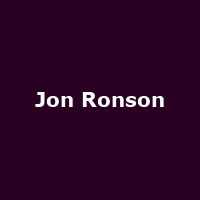 Jon Ronson is Welsh journalist, author, filmmaker, screenwriter and radio presenter. He wrote the the best-selling books: "The Men Who Stare at Goats" (2004), "The Psychopath Test" (2011) and 2015's: "So You've Been Publicly Shamed". In 2017 he co-wrote the screenplay for the Netflix film, "Okja", along with Bong Joon-Ho and he hosts the podcast, "The Buterfly Effect".